Among the duties of the Greek Goddess Iris was that of leading the souls of dead women to the Elysian Fields. In token of that faith the Greeks planted purple Iris on the graves of women. 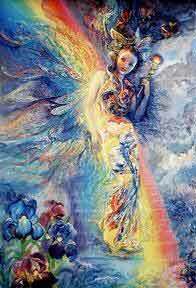 Iris was the messenger of the gods and the personification of the Rainbow. The Greek symbolism for the iris comes down to us by word of mouth in the form of a myth that was old in Homer's day. Between three and four thousand years ago an artist was commissioned (more likely commanded) to model in stucco on one of the walls of the great Minoan palace at Knossos a representation of the priest-king. When he finished the figure of the youth in low relief he painted around it a background of many iris. A comparatively short time after Iris bloomed on Minoan walls it appeared sculptured in stone at Karnak in Egypt. Thutmosis III (1504-1450 b.c.) celebrated the conquest of a large slice of Asia Minor by having a garden built near one of his palaces to display some of the plants he had brought back from his campaign. He felt a number of these seemed exotic enough to be carved into stone on the great wall of the temple of Anon. Leaping forward through time we know that the Fleur-de-lis as a conventional form long predated its association with the Kings of France. There are various legends of how the iris came to represent the French monarchy but most center around two historical incidents separated in time by six hundred years. Clovis who in 496 A.D. is said to have abandoned the three toads on his banner in favor of the fleur-de-lis. His Christian Queen Clotilda, had long sought to convert her heathen husband but he always ignored her plea. Then faced with a formidable army of Alamanni, the Germanic tribe invading his kingdom, he told his wife that if he won the coming battle he would admit her God was strongest and be baptized. He did win and the toads whose symbolism would be most interesting to know disappeared. The second incident occurred in 1147. Louis VII of France had a dream that convinced him to adopt the purple iris as his device shortly before setting out for his ill-fated crusade. Thus the fleur-de-lis became the symbol on the banner of France for the next six hundred years. Or twelve hundred years if we take it from the time of Clovis that the iris became the symbol for a great nation. The iris was so powerful a symbol of the French kings that the Revolutionaries in 1789 set out to totally obliterate it the symbol of the hated monarchy. It was chipped off buildings and torn from draperies. Men were guillotined for wearing a fleur-de-lis on their clothes or as jewelry. The revolution succeeded and the symbol of the fleur-de-lis is only a memory now and is considered merely a conventionalized ornament or decoration. Cultivated by the Egyptians and according to Dioscorides both the Greeks and the Romans used the rhizomes for medicinal purposes and in perfumery. Pliny the Elder wrote of Iris cultivation and noted that the choicest varieties came from Silistria and Pamphylia. In the dark ages Charlemagne noted the culture of Iris in France and the Arabs grew them in Moorish Spain. The Iris bloom is the emblem of Florence, Italy. In nineteenth century Italy, the production of dried Iris rhizomes was almost a major industry. Three people could plant about 5,000 in one day. Three years later the rhizomes were harvested, skinned and dried in the sun. They were of major value to the Perfume industry. A large portion were used by well-known distillers in Florence but about 10,000 tons in 1876 were exported to other countries, including the United States. Although Iris were mainly prized for the perfume made as described above they were also of major importance as medicine for the treatment of illness. The rhisotomi (root diggers) were the druggists of primitive Greece and even its doctors. Pliny stated that iris should be gathered only by those in a state of chastity. During the Dark Ages monasteries treasured the few copies of manuscripts that were swept up by scholars and carried off to Constantinople when thousands of such books were destroyed with the fall of Rome. One of these continued in use until modern times. It was i. germanica. But it has lost its medical importance and iris now is relegated to nothing more than flavoring for toothpaste. Our own native iris was used for a long time for the treatment of dropsy an syphilis. In Germany orris root which is made from iris used to be suspended in beer barrels to keep the beer from going stale and in France it was hung in wine casks to enrich the bouquet of the wine. In England orris root was used to give the peculiar flavor to artificial brandies made there. In Russia, in czarist days orris root flavored a soft drink that was made with honey and ginger and sold on the streets. From earliest times perfumes were used as an offering to the gods. Orris root when thrown on a fire gave off a most pleasant scent. And until the synthetic ionome was discovered a little more than 80 years ago all violet scented powders and perfumes were distilled from iris. It also had the quality of being able to strengthen the odors of other perfumed substances thus was valuable as a fixative. For a long time orris root was responsible for making social interaction bearable. It was used as a perfume for linen and is mentioned in 1480 in the wardrobe accounts of Edward IV. Several pieces of dried orris root strung on a string would be plunged into the boiling water with the clothes. "Swete cloth" if so achieved could only have been linen. In those times people wore wool or if they were important silk,satin. or velvet. There were no dry cleaners then so "Swete cloth" underneath the clothes amd a great deal of perfume on top was the best to be done, since bathing was considered dangerous. Orris root also was important to the new high hair fashions that at one time towered two feet off the ladies foreheads. They were powered with orris root which was added as a perfume to flour or starch.. One of the complaints of the hungry peasants in France was that so much of the flour they needed for food went to dress the hair of the nobility. The French revolution brought an end to the powered hair fashion not only in France but all over Europe. Modern chemistry has eliminated the need for iris as a medicinal drug and the coming of synthetics has replaced its necessity for perfumes and cosmetics. Now it is simply an ornament in our gardens. But for over a thousand years it served mankind first as a religious symbol and than as the ultimate frivolity. The fleur-de-lys is the emblem for the city of New Orleans.